A common conundrum when planning a cookout or barbeque is determining how much food to make. Cooking in quantity presents certain unique challenges. You need to plan ahead and purchase the right amount of ingredients. Sometimes it can be hard to visualize large quantities of food. When you're cooking a family dinner, you usually have a good estimation of how much your family will eat and can plan properly. When you're cooking for a large group, like 100 people, you have to make an educated guess. You don't want to run out, but at the same time, you don't want to have too much food leftover. Determining the side dish quantity is pretty simple. Use these recommendations for potato salad, cole slaw, or other similar sides. It is safe to assume that most people will consume about 5 to 6 ounces (by volume) per person of a side dish. If you're serving 100 people, that's 500-600 ounces or about 4 to 4½ gallons of potato salad. Find your favorite recipe and use a cooking conversion tool to help make some calculations. A conversion chart may also be helpful in determining how to scale up recipes. Cooking meats are a somewhat different matter, especially when you're serving more than one type, like burgers and hot dogs. Some people may only want one burger, while others may want a burger and a hot dog. Still, others may want two hot dogs, and so on. It's impossible to predict all the inevitable combinations, so you'll have to estimate based on the crowd size. In general, it's safe to assume that each guest will want one burger and one hot dog, and then add twenty percent for anyone who may want multiples. So if you are hosting 100 people, that's 120 hot dogs and 120 burgers. If you're purchasing pre-made hamburger patties, purchase 120. If you're making the patties yourself (to save money or because you love making burgers), assume four burgers per pound of meat. 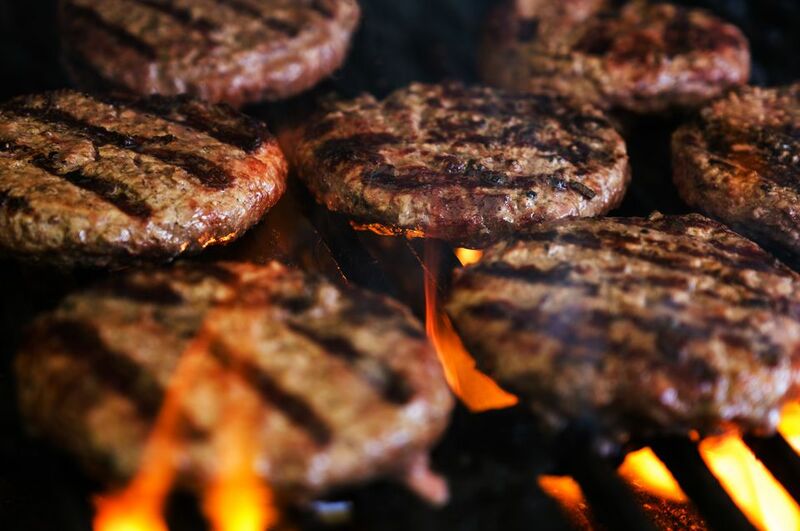 For 120 burgers you'll need 30 pounds of ground beef. In addition to the meat, don't forget to get the right amount of buns and condiments for the party. If you find yourself with leftovers of the side dishes, it can be helpful to put out plastic containers at the end of the party and allow guests to bring some food home. If that is not an option for you, the salads can be stored in the refrigerator and saved for a few days. If they have been outside for long periods of time or don't look appetizing anymore, throw them away. Pace yourself as you cook the meat. If it seems that the eating has slowed down and you have uncooked meat or hot dogs, store it in the refrigerator. If anyone requests more meat, it's easy to oblige. At the end of the party if you still have uncooked protein, seal it tightly and freeze it for another day. Cooked hot dogs and hamburgers don't usually make good leftovers, so it's best to throw them away.